Western Wyoming, with its windswept plains, jagged mountains, and refreshing, airy solitude, exudes a classical romance that’s lost on the developed, urban US. It should only make sense then that this rustic church built in 1925, with a glass window behind the pulpit that frames the snowcapped Tetons, is one of the most scenic and popular places to get married in all of Wyoming. 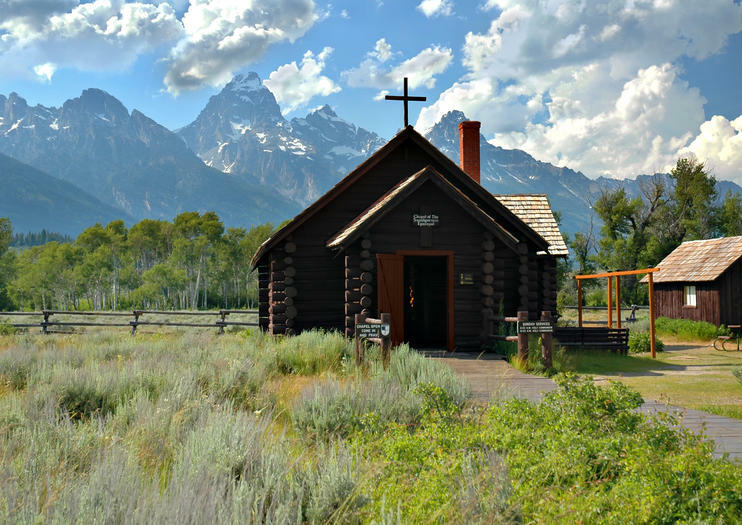 Here at the Chapel of the Transfiguration in Grand Teton National Park, loved ones gather to exchange blessings and vows amidst the golden plains, and ring the bell, cast in 1842, that still hangs from the ranch style bowery. Though weddings here are most popular in summer, from May through the end of September, the church is open every day of the year—provided the door isn’t blocked by snow from a recent winter snowstorm. While the church was built as a place for worship for early Wyoming pioneers, today it’ a classic photographer’s favorite inside of the National Park, and a wooden reminder of the western spirit that still survives here today. The Chapel of the Transfiguration in Grand Teton National Park is 1.1 miles north of Moose Junction, on Chapel of the Transfiguration Road. In 1980, it was placed on the National Register of Historic Places, and as an active part of the Episcopal Church, services are held on Sunday mornings at 8am and 10am in summer. Hours: Open 24 hours, except during wedding ceremonies. On this Grand Teton day trip from Jackson Hole, experience one of America’s most astounding landscapes from the comfort of a coach vehicle. In between views of the jagged Teton Range and a visit to the shores of Jenny Lake, you'll learn the geology and history of the Tetons from your knowledgeable local guide. You’ll also visit Menor’s Ferry and Chapel of the Transfiguration — both are on the US National Register of Historic Places. Bonus: You could even spot moose, beavers, or eagles on a guided walk.